Two police officers were “simply having lunch” at a strip mall pizza buffet in Las Vegas when a man and a woman fatally shot them in point-blank ambush, then fled to a nearby Walmart where they killed a third person and then themselves in an apparent suicide pact, authorities said. [...] Witnesses say one of the shooters yelled, “This is a revolution” and "Tell the police the revolution has begun”. The suspects, Jerad and Amanda Miller, draped the Gadsden ("Don’t Tread On Me”) flag on the bodies of the officers. The Gadsden flag has been the symbol for the Tea Party since 2009. "Don’t Steal, The Government Hates Competition." 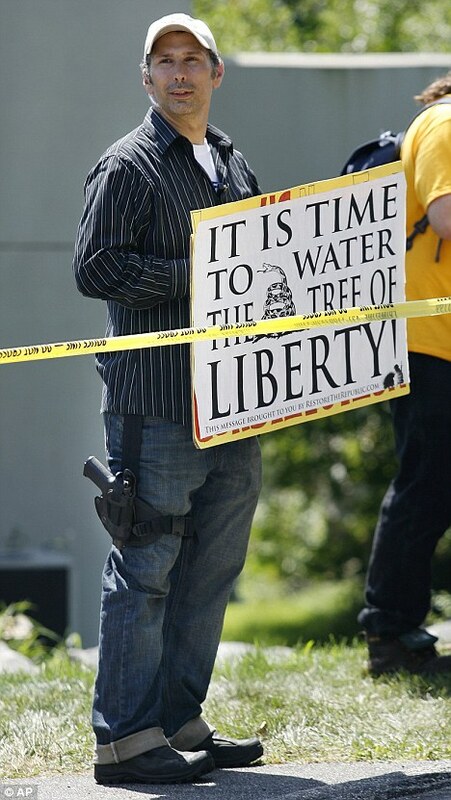 "It's time to water the tree of liberty [with the blood of patriots and tyrants]." Everywhere I have seen this story reported, the event has been called a "shooting", an "attack", an "ambush" or a "rampage". But this strikes me as oddly forgiving and inequitable. If this incident had taken place in somewhere like Iraq and the killers were associated with a local ideology, journalists would be calling it a terror attack by political/religious extremists. Why are most reporters calling the Las Vegas incident a shooting and not a terror attack by right-wing Tea Party extremists? Wouldn't it be fair to call this a terror attack if the killers had been left-wing Occupy Wall Street extremists? Why do leading politicians describe the same incident with different language? Is there a double standard that begins at the U.S. border? We could refer to them as right-wing Tea Party extremists, but the Tea Party would disavow them as not "real" Tea Partiers, the same way suicide bombers are not "real" muslims and abortion clinic bombers are not "real" xians. I actually think they are the most real examples of their respective groups; they do more than simply pay lip service to the clearly outlined fundamentals of their ideologies. Just call a tea party member a tea bagger. It really upsets them. Irregardless of political affliation these individuals do not represent mainstream conservative America anymore than Timothy McVeigh did. I know too many members of the Tea Party who consider the actions of these particular wackos as atrocious and unnecessary. I think you're way off base on this one. That's true. "Mainstream" members of any group talk the talk. It's the fundamentalist extremist members of the group that walk the walk. They follow the same fundamental ideologies. Some just take it seriously enough to take decisive action. The violent rhetoric gets repeated and amped up until some unhinged person takes action. Then the ones spouting the rhetoric claim no responsibility or connection. Ed, I really don't think we are that far off at all. I believe there is a really thin line between sympathy and action. Given the right circumstances I'm sure many in the Tea Party would be deliriously overjoyed to see a fascist state reign supreme in the United States. These two scum buckets in Las Vegas were just a little too early getting on board their "revolution". It's sad to see people actually proposing the use of armed violence against the the duly elected government of the United States. Exactly what crushing totalitarian or despotic regime are they living under? They can arm themselves legally to the teeth, spew veiled threats against this nation and engage in all manner of hate speech and the very "gubbamint" they see as their oppressor is the one that insures them this freedom. What's really sad is the underlying mass paranoia that consumes the thinking of conservatives. The combination of right wing theocracy, uber-patriotism, racism is really fueled by billionaire sociopaths who as Bobby Kennedy put it," won't be happy until they have achieved a feudal society." When an organization condones and encourages violence against innocent civilians as a mean to instill fear to achieve political objectives, those violent actions are called terrorism. The question then becomes if the Tea Party condones and encourage violence to further their political goals. If that is indeed the case, you have a double standard; If it isn't, you don't. It depends on what you consider to be "condoning and encouraging" violence. I didn't hear any Tea Party mainstreamers decry Sarah Palin's use of bullseye targets on a map as a way to indicate congressional districts that were opposition controlled. No doubt many mainstreamers were titillated and amused by the imagery and strong talk. But they were loud and clear after Giffords got shot, distancing themselves from Loughner and characterizing him as a random psycho. Clearly he was psycho, but not random. Condoning and encouraging murder is hardly an ambiguous statement. Terrorist organizations literally condone and encourage murder, which is part and parcel of what constitutes being a terror organization. IRA placed bombs in train stations, Al-Qadea flew planes into buildings, Shining Path assassinated people, Hamas makes suicide vests, Hezbollah fires rockets into populated areas, etc. I hardly find it difficult to understand what a terrorist organization is, and one must have a very serious case of postmodernism if one is having a hard time to ascertain the details. There is some ambiguity to condoning. It could mean openly supporting something or it could just mean turning a blind eye to it. While many organizations don't openly support violent acts, many do turn a blind eye to violence-inciting rhetoric or imagery or scripture. They turn a blind eye and reap the political benefits when members of their group use these techniques to "stir up the base". Then, when some nutbar from their camp crosses the line, they say they don't condone violence. It happens so consistently and predictably that maybe we should name it. How about the old "Terror Two-Step"? Condone means to accept violence as necessary, usually by way of the organizations founding ideology, while encourage means to give support, usually through training and weaponry. If you want ambiguity, you hit it on the head with the term 'violence-inciting'. I go by Mill's Harm Principle of "positive instigation to some mischievous act" when it comes to culpability of inflammatory speech leading to a mischievous act. If everyone which overuse pathos must stand liable if lunatics get carried away by what they say we may as well cancel free speech altogether. Your definition of condone is narrower than mine, just broad enough to suit your purpose. I am not talking about legal culpability as if I handed someone a gun and said, "Go shoot John Doe." I'm talking about the moral responsibility of creating an organizational culture that breeds disdain and devalues people with opposing viewpoints. we may as well cancel free speech altogether. - Speech is not free. Everything has consequences. - I'm not talking about making laws restricting these groups 1st Amendment rights. I'm just talking about calling them out and calling them what they are; you know, exercising MY 1st Amendment rights. Then maybe fewer mainstreamers will feel like joining up.